In our previous post we asked who gets the blame for crime in Venezuela. In this one we ask what Venezuelans think can be done to reduce that crime. Since 2008 the Chávez and now Maduro governments have increasingly taken on the issue of crime, often in quite contradictory ways. Here we look at if and how these strategies resonate with citizens’ opinions. To do so we added a question to Datanalisis’ July-August Omnibus survey that asked respondents what they thought would reduce crime. The question provided respondents with a list of measures (improving the values taught to children by the family; decreasing poverty and social inequality; professionalizing police officers; reforming the judicial and penal systems; a permanent deployment of military in sectors with high rates of crime; improving access to sports and cultural activities; and improving access to public space) and asked them to rank the three most important in fighting crime. The first table presents the percentage of number one responses each measure received. These results are consistent with those we described in our first post. Family values was the most common first choice for reducing crime with almost 30% naming it. Indeed 67% of respondents mentioned it among their top three (see below). As we mentioned before, pointing to the family effectively privatizes and depoliticizes crime. But it also heavily genders it. In the Venezuelan context “the family” often boils down to single mothers who are portrayed as “not doing their jobs.” Such mothers are often referred to as “alcahuetas,” a label that specifically refers to women who cover up or ignore the bad behavior of their sons. While over 50% of respondents thought that crime would best be addressed by addressing social and cultural causes, it is notable that over 30% of respondents saw reforms in police, penal and judicial systems as the most important actions that could be taken to fight crime. This compared to only 12.3% that saw military deployment—the Maduro government’s favored strategy—as the most effective way to reduce crime. The second table, which aggregates all mentions, supports these trends. 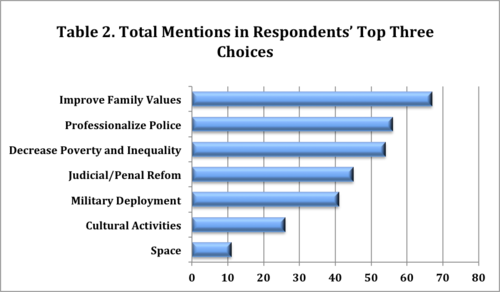 While improving family values is the most common choice, “professionalization of police” is the second most commonly mentioned response, even surpassing “decreasing poverty and social inequality.” Indeed over half of the respondents chose this among their top three. Thus, while average Venezuelans do not seem to think police corruption or inefficiency are major causes of crime, they do seem to believe that a professional police force and improved judicial and penal system could reduce crime. Of course, it is unclear as to what respondents have in mind when they chose “professionalize the police.” While some might be thinking about improved police training and supervision, others surely are thinking about better weapons, vehicles, and technology (we will address this issue in a future post). 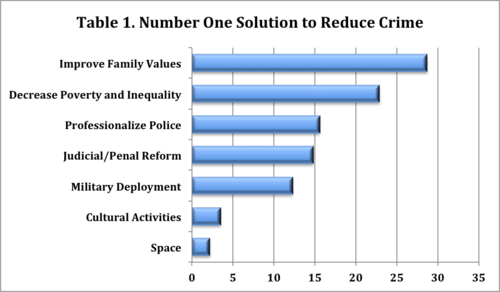 According to these numbers there is significant support for military deployment as a means for reducing crime. 40% of respondents included it in their top three choices. However, anyway you cut it, there is significantly more support for citizen security reform.